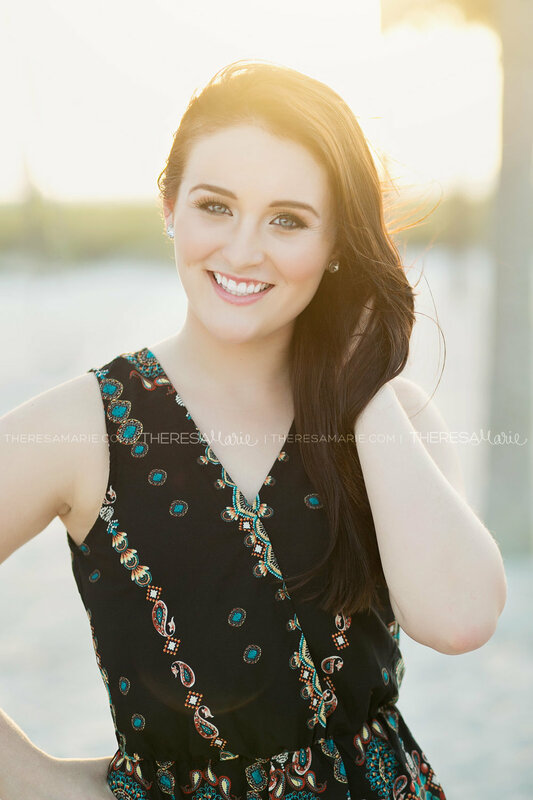 "Theresa Marie is the best senior photographer in FL in my opinion." "Being an introvert, I was nervous about my senior pictures. I was worried I wouldn't be able to let loose, be myself, and just have fun. However, after meeting TheresaMarie I realized she was just as excited as I was for my senior pictures. She could not wait to incorporate my many hobbies and passions. The day of the shoot arrived and my mom basically hauled my entire closet to the shoot. No worries though, because TheresaMarie sorted through all of my clothes and picked out the perfect outfits. After makeup and putting on my first outfit, we jumped into the cars and headed to our first location. We jammed to my favorite music the entire night. I felt like a goddess. To sum it all up TheresaMarie gave me a thank you bag filled with everything a girl could want (and a couple things for mom). After hugging goodbye, I realized I could not have had a better senior picture experience. TheresaMarie is the best senior photographer in FL in my opinion. She has all the components for an amazing experience and amazing photos. Her personality makes you feel at home immediately and you can just be yourself. I highly recommend TheresaMarie to all seniors." "Theresa Marie and I instantly bonded." “My family and I hesitated when it came to my senior pictures because we wanted my photos to have quality and life to them… We wanted to be able to look back in ten years and say, “Wow, this is exactly how I remember Courtney when she was younger.” I personally wanted to be able to feel something special when I looked at each picture. I started looking on the TM website and all of her beautiful work instantly caught my eye. Right then, I knew that my mom and I had to book my shoot. Choose Theresa Marie! Not only is she amazing, but her photography skills are also amazing. She has made my dream of having perfect senior pictures come true; as well as many other seniors I’m sure. Theresa Marie makes you feel like you matter, not just getting the right picture. She made sure my pictures were 110% me and she made sure I was comfortable all throughout the shoot and never once did I feel uncomfortable. Theresa Marie is the way to go. You won’t get better senior pictures anywhere else, I’m sure of it. "Doing my senior pictures with Theresa Marie was the best thing I did all senior year!" "When we walked into her studio it immediately felt comforting." “We wanted to do senior pictures but couldn’t quite find the right prices or photographer that we liked. When we found Theresa Marie’s website it was an easy decision! We loved her photos and after speaking to her, the prices were reasonable so we emailed her and set up a date! When my appointment came around I have to admit i was a tad bit scared, but when we walked in her studio it immediately felt comforting. The room was set up so cute and as her stylist did my hair and makeup we conversed about things I liked to talk about and she even played my favorite Pandora station! We started to take the photos shortly after and at first i was being my awkward self not knowing what to do or where to look, but Theresa Marie made me feel really comfortable and reminded me of a friend. Before i knew it i was right in the swing of things and was posing for the camera at ease. She would tell me what to do at times and then let me do my own thing too. She is so genuine – I’m a really shy person and she got me to come out of my shell. "I’ve never looked so confident and naturally happy in any photo I have ever taken." “I was nervous that I wouldn’t photograph well on the day of the shoot. I kept imagining that I would have a bad hair day, or that I would end up smiling too hard turning it into a fake smile that would translate in the photos. But then when I met Theresa Marie, those anxious feelings changed because she made me feel so much more confident. All the helpful tips and compliments she gave me truly helped me relax and just be myself. Theresa Marie truly captured my persona in the shoot, the smiles were definitely not fake and my hair looked fantastic! The experience went better then I could ever imagined. From the beautiful locations, my outfits and the enthusiasm of Theresa Marie from the moment we met, to picking out the photos made the overall experience fun, simple, and memorable. "There was never a dull moment because she always keeps it fun and interesting." “My family and I were hesitant about choosing a photographer that captured my personality, and we wanted to make sure the photos were genuine. When I came across Theresa Marie’s website, I loved the way her images looked, they were exactly what I was looking for! My experience with Theresa Marie was amazing! There was never a dull moment because she always keeps it fun and interesting. I also loved all the spots she had chosen for the pictures, they were all beautiful! When I first saw my images I thought they were so beautiful! I couldn’t wait to show all my family and friends! I am so happy I chose her to do my senior pictures, these are photos I will have for the rest of my life and are absolutely gorgeous! My family and myself will always cherish them. “We were hesitant at first because we knew that senior pictures could be pricey, but we chose Theresa Marie because we knew she had a great reputation and we had seen her work from many of my older friends. My experience was fantastic! I felt like a model for the day and had so much fun. Every part of it was exciting and new to me, yet came so naturally. Then when I saw my images I was shocked! They were better than anything I could’ve imagined. They captured me and my personality perfectly. "Theresa made everything so inviting." “I am an obnoxious, over-the-top individual, yet very nervous in front of new people, so I was hesitant that I would get in front of a camera and look like a deer in the headlights, but when looking for photographers, I was drawn to Theresa Marie’s as everyone in the pictures seemed super down-to-earth and not nervous at all. Theresa made everything so inviting. Small things like discussions about TV and movies and being able to play my Kacey Musgraves made the experience more warm than I expected. Theresa is there to help you look and feel your best and, trust me, by the end of the session, it will DEFINITELY show in your photos! "Finding her was a miracle." "She got to know who I am and what I was comfortable with." It was everything I could ever hope for and more. “I had no hesitations when deciding whether to take senior pictures or not. I chose Theresa because she did my family pictures a few years ago and I loved them, and I’d seen her other senior portraits and loved them. My experience was amazing. It was everything I could ever hope for and more. If there’s anything I could share with my friends, it would be to just be yourself and she’ll capture the real you. Don’t be nervous about looking stupid or silly, because those actions make the best pictures. I was in love with my images when I first saw them. Never in a million years did I think they’d turn out that amazing. I wouldn’t have changed a single thing, my experience was perfect. "Choose Theresa Marie because you definitely won’t be disappointed!" “Going into my senior year, I knew the one thing I wanted to leave high school with were gorgeous senior photos. However, I didn’t want regular, “run-of-the-mill” photos. I wanted them to show ME, so I could look back on them in the future and remember exactly how I was when I was 18 years old. I found Theresa Marie through a web search for senior photographers in the Tampa area and I knew immediately when scrolling through her portfolio that I needed my photos done with her. With Theresa Marie, I got everything I wanted and more. My photo shoot with Theresa Marie wasn’t just a shoot… it was an experience! The shoot was so special. I had a blast hanging out with my best friend Kait, my mom and Theresa. I felt like a model! Theresa made me feel completely comfortable in front of the camera and helped me every step of the way with my hair, posture, and more. My photos were absolutely perfect! Before I saw my images, I never realized how much one photo can say. Theresa captured moments that I will treasure forever. Her keen eye for creativity, appreciation for all things unique and her outstanding photography expertise cannot be replicated! I wanted my photos to show my personality and spirit and Theresa Marie captured that. “My senior photo shoot experience with ‘Theresa Marie’ was incredible! I had so much fun preparing for the shoot as well as during the shoot. Theresa Marie made me feel so comfortable and made it easier for me to be myself in front of the camera. Before the shoot, I was so excited but nervous at the same time because the weather was starting to get colder and I had no idea what to wear or how to do my hair but once I figured that out I just felt excited! During the shoot I had so much fun and that is what I wanted because I wanted my photos to show my personality and spirit and Theresa Marie captured that. Especially in the candid shots where I am laughing at something or she told a classic joke or she tried to get me to loosen up and have fun. "Couldn’t have picked a sweeter photographer." “I am very proud of my senior pictures. I am not big on taking pictures, so we wanted someone who could take simple pictures, and not overwhelm me too much. Theresa Marie was the perfect person for the job! My experience was amazing! Theresa is so sweet, couldn’t have picked a sweeter photographer. I didn’t feel uncomfortable at all, she helped me a lot to figure out how to pose and what face to make, so I didn’t feel so awkward. My pictures turned out amazing! Didn’t know I could look that good in a photo!